Reserve Museum-Quality Traveling Banner Exhibits - Free! Available FREE to Museums, Libraries, Zoos, Aquariums, Botanical Gardens and More. The Paly Foundation's NatureExhibits provides science-based, nature-conservation themed exhibits to museums, libraries, zoos, aquariums, botanical gardens and other qualified organizations for free, excluding shipping. Our exhibits come efficiently packed with easy-to-follow instructions. Large, but lightweight and sturdy vinyl panels displaying beautiful graphics and engaging content. Stands and hardware for either floor display or for hanging the panels from walls or ceilings. Select exhibits feature an Educators Guide with ideas for presenting the exhibit to different age groups, additional activities, games, and resources for a deeper dive into the subject. Clear instructions for unpacking, setup and re-packing/shipping. Appropriate ages – Exhibits are designed for school grades K-12 and beyond. Children in lower grades may need assistance with some vocabulary and comprehension of the presented science. There has been a lot of buzz around the importance of bees and their decline in population. This important news is just the tip of the iceberg. There is much more to learn about the world of pollinators! A wide variety of animals and insects, from bats to birds to bees to butterflies, help plants reproduce, and create fruit, nuts, and seeds. In this exhibit, learn about the diversity of pollinators and how all contribute to our own quality of life by helping to provide good food, gorgeous surroundings, medicines -- even clothing! Who knew a little insect or bat could do all that! Pollinators are on the decline, but YOU can help! Learn about the conservation success of the lesser long-nosed bat and the international teamwork that saved this bat from extinction. Then, explore other species and how they can be saved. With gorgeous pictures, amazing facts, and fun activities, you’ll never experience a walk (or a bite!) the same way again! 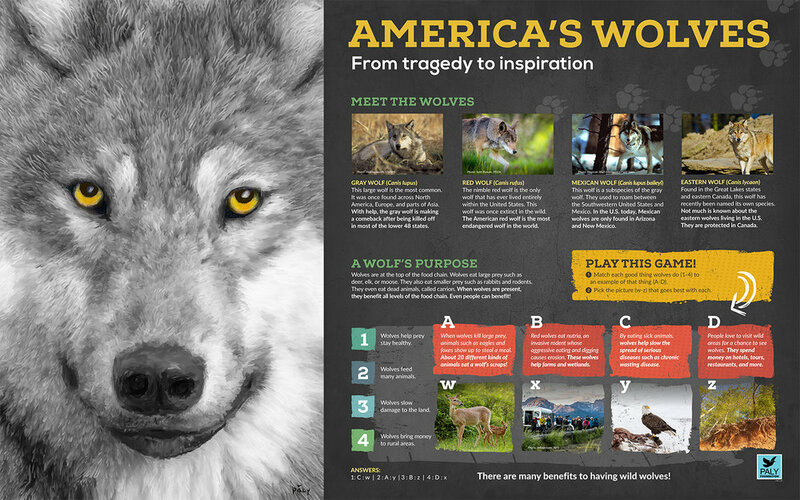 In this exhibit, discover America’s wolves – the Red Wolf, the Gray Wolf, the Mexican Wolf and the Eastern Wolf. Anyone can access even more content by scanning the QR code on the last panel of the exhibit. Facilities can use the Educators Guide and Best Practices to plan event activities. In this exhibit, explore the world of African elephants. “Nature’s Farmers” Learn how elephant behaviors such as digging, grazing, and clearing the land, benefits the plants, animals, and people who share their habitat. Is your family like an elephant herd? Elephants have complex emotional lives and strong family ties. Take a “personality quiz” to see how similar your family is to an elephant herd. The war on elephants. There is a war raging over elephant tusks. Learn how the ivory trade puts money directly into the pockets of terrorists, militia groups, and organized crime. In fact, conserving elephants is considered “a must” for homeland security. Can elephants recover? The pace of elephant poaching quickens as the demand for ivory goes up. Over 30,000 African elephants are killed every year, making the possibility of extinction real. Learn what is being done to help elephants and what YOU can do here at home, to help. In some parts of the world, people share their environment with tigers just as we share ours with coyotes or hawks. In this exhibit, explore the world of the tiger. Tigers are amazing! Test your knowledge of tigers while learning some interesting facts. Why do they have those stripes? How are house cats similar to the world's largest cats? Tigers are important! As apex predators, tigers keep their habitats in balance. This means lower levels of the food chain, including plants, depend on tigers. Humans have relied on this balance for thousands of years, tigers are a part of their cultural heritage. Endangered Species - The chief threats to tigers in the wild are loss of habitat and poaching. Three species of tigers are already extinct. And only about 4,000 tigers are left in the world today. Hope for tigers - Conservation efforts for saving tigers, in their natural habitats, are underway. 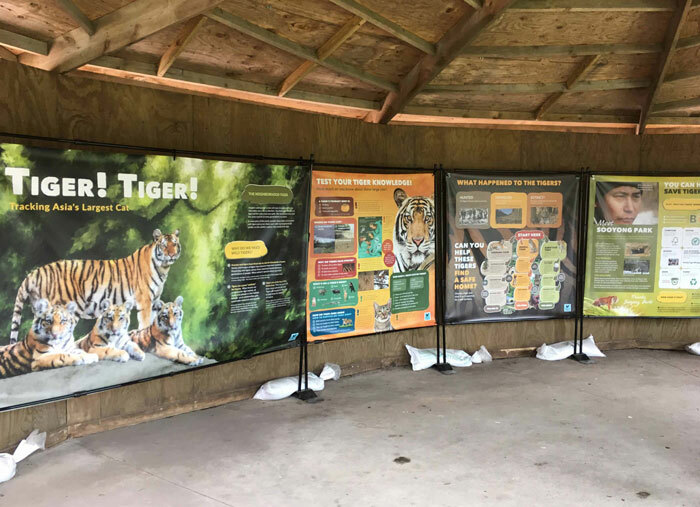 Learn about the innovative methods being implemented to make sure tigers continue to have a home in a balanced ecosystem. Every person, regardless of age or location, can help save tigers! Biology of Corals – Coral animals have been around since before the dinosaurs. Learn all about this amazing creature and how they help sustain over one million species of plants and animals. Our dependence on the reef - coral reefs prove their invaluable worth by providing everything from food and shelter to cancer-fighting medicines and more. Dangers to coral reefs - Coral reefs may be gone even before we can fully understand them. Learn about the many threats facing coral reefs, including how our fascination with reefs can be harmful. Conservation efforts - Efforts to help conserve coral reefs include large-scale initiatives and dedicated individual action. Pick a single action from the exhibit recommendations and have a collective effect in saving this natural wonder. Experience the epic life of Harriet Hammerhead, a great hammerhead shark! Take a peek inside Harriet's diary to explore hammerhead sharks and their importance as apex predators and keystone species of the world's oceans. Biology of hammerhead sharks - Learn what makes hammerheads some of the most unusual fish around. Sharks are "cartilaginous vertebrates". They have skeletons of cartilage rather than bone. But don't be fooled, the anatomy of the hammerhead makes it an efficient predator. That's not all, hammerheads give birth to live "pups", exhibit some interesting social behaviors and even have a sixth sense. Hammerhead sharks are important - Learn why ocean ecosystems all over the world depend on hammerheads and other sharks to thrive. The disappearance of hammerheads causes disruption and endangers all levels of the food chain. Dangers to hammerheads - The primary dangers to hammerheads are the demand for shark fin soup and bycatch. How many sharks are we talking about? Over 10,000 sharks are killed per hour around the world. Conservation efforts - Can sharks be saved? Learn about the efforts of people dedicated to saving sharks as well as what "everyday people" can do to help. The Rhinoceros: The mighty rhinoceros is known all over the world for its large size and "nose horn" ("rhinoceros" in Greek). It is commonly compared with a sturdy tank for its formidable appearance and strength. The Pangolin: The humble pangolin is a little-known creature covered head-to-toe with unusual scales. It often walks on its two back feet. Some even climb trees. For its scaly and compact appearance, it is commonly compared with an artichoke. In this exhibit, explore the dangers facing both rhinos and pangolins, stemming from the demand for their keratin-rich horns and scales. Both are being hunted toward extinction. Rhinos are on the edge, and over 100,000 pangolins are killed per year, making them the most poached animal on Earth. What is keratin? Keratin is a strong protein grown by many animals. Human hair contains keratin. So do human fingernails and toenails. How do rhino horns and pangolin scales lead to poaching? An incorrect belief that horns and scales can cure a variety of illnesses has led to massive demand. Organized crime and militia groups poach both rhinos and pangolins, using the income to fund terrorism. Can these animals be saved? Saving rhinos and pangolins depends on the same process. Stopping demand. Stopping poaching. Protecting habitat. Learn about people who are successfully helping rhinos and pangolins and how YOU can too!